Faber & Faber, 9780865478534, 176pp. Breakfast’s boiled egg, the overhead hum of fluorescent lights, the midmorning coffee break—daily routines keep the world running. But when people are pushed—by a coworker’s taunt, a face-to-face encounter with a woman in free fall from a bridge—cracks appear, revealing alienation, casual cruelty, madness, and above all a simultaneous hunger for and fear of the unknown. Daniel Orozco leads the reader through the hidden lives and moral philosophies of bridge painters, men housebound by obesity, office temps, and warehouse workers. He reveals the secret pleasures of late-night supermarket trips for cookie binges, exceptional data entry, and an exiled dictator’s occasional piss on the U.S. embassy. A love affair blooms between two officers in the impartially worded pages of a police blotter; a new employee’s first-day office tour includes descriptions of other workers’ most private thoughts and actions; during an earthquake, the consciousness of the entire state of California shakes free for examination. 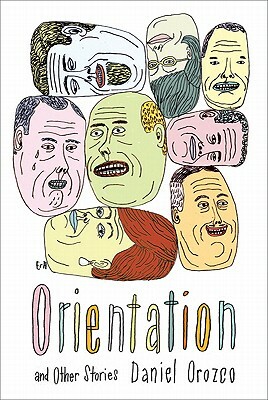 Orientation is a Kirkus Reviews Best of 2011 Short Story Collections title. Daniel Orozco's stories have appeared in "The Best American Short Stories," "The Best American Mystery Stories," "The Best American Essays," and the "Pushcart Prize "anthology, as well as in publications such as "Harper's Magazine," "Zoetrope: All-Story," "McSweeney's," "Ecotone," and "StoryQuarterly." He was awarded a 2006 NEA Fellowship in fiction, and was a finalist for a 2006 National Magazine Award in fiction. A former Stegner Fellow and Jones Lecturer at Stanford, he teaches creative writing at the University of Idaho.